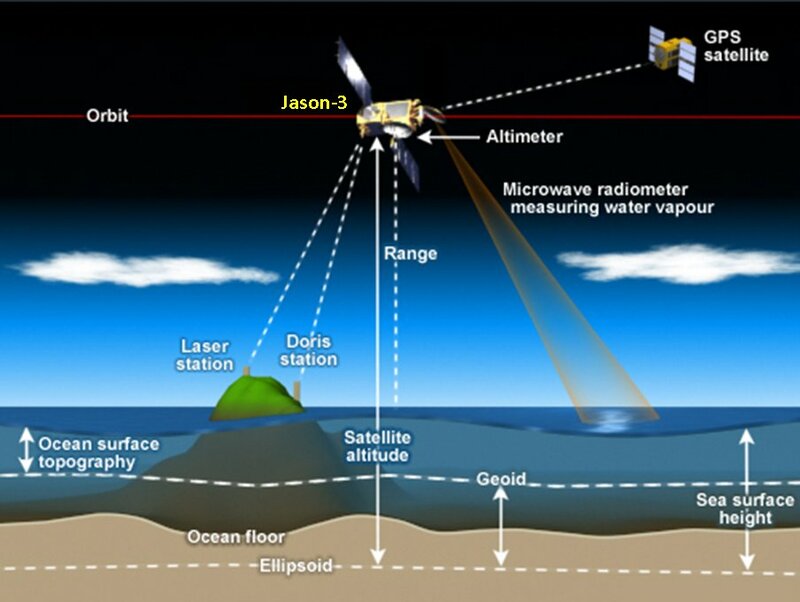 Jason 3, the sea surface height "mesurer"
NOAA, NASA, Centre National d'Etudes Spatiales (CNES, France’s governmental space agency) and European Organisation for the Exploitation of Meteorological Satellites (EUMETSAT). 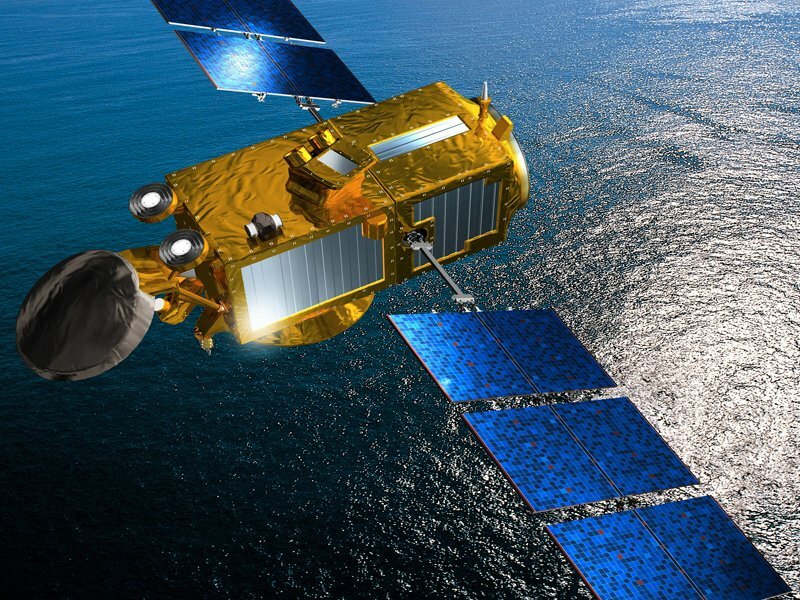 "Jason-3 will measure the shape of the global sea surface to an accuracy of better than 4cm." "It will track currents, tides, winds, wave heights, and will help forecast the intensity of storms." 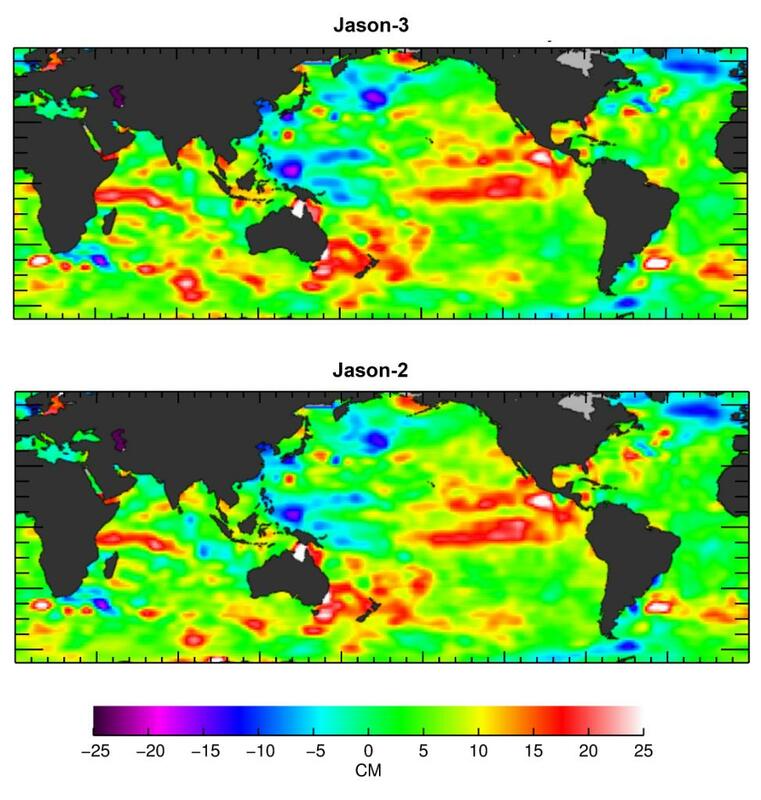 "The Jason satellites act as an early warning system for El Niño by detecting the developing bulge in surface waters associated with the warming." "Just over a month after launch, Jason-3, a U.S.-European oceanography satellite mission with NASA participation, has produced its first complete science map of global sea surface height, capturing the current signal of the 2015-16 El Niño." What is on board the altimetric satellite Jason 3? The primary instrument onboard Jason-3 is its radar altimeter. "Poseidon-3 emits pulses at two frequencies (13.6 GHz in the Ku band and 5.3 GHz in the C band) to measure very accurately the distance from the satellite to the sea surface and then to derive the surface altitude(within a few centimeters) using its precise location of the satellite. The two frequencies are used to determine the atmospheric electron content. Free electrons in the atmosphere can delay the signal’s return, which affects the radar signal path delay and measurement accuracy. The delay is directly related to the radar frequency, so the difference between the two measurements can be used to determine atmospheric electron content. These two frequencies also serve to detect the rain events. The strength and shape of the returning signal also provides information on wind speed and the height of ocean waves." Provided by NASA, "AMR-2 is a passive microwave radiometer that measures radiation from Earth's surface (brightness temperatures) at three frequencies (18.7, 23.8, and 34 GHz). These different measurements are combined to determine atmospheric water vapor and liquid water content. Once the water content is known, it is possible to determine the correction to be applied to the altimeter for radar signal path delays (the brightness temperatures are converted to path-delay information)." "The 23.8 GHz channel is the primary water vapor sensor, the 34 GHz channel provides a correction for non-raining clouds, and the 18.7 GHz channel provides the correction for effects of wind-induced enhancements in the sea surface background emission."